To demonstrate how you can define your own page layout, we will modify the original layout of the Zend Skeleton Application website. 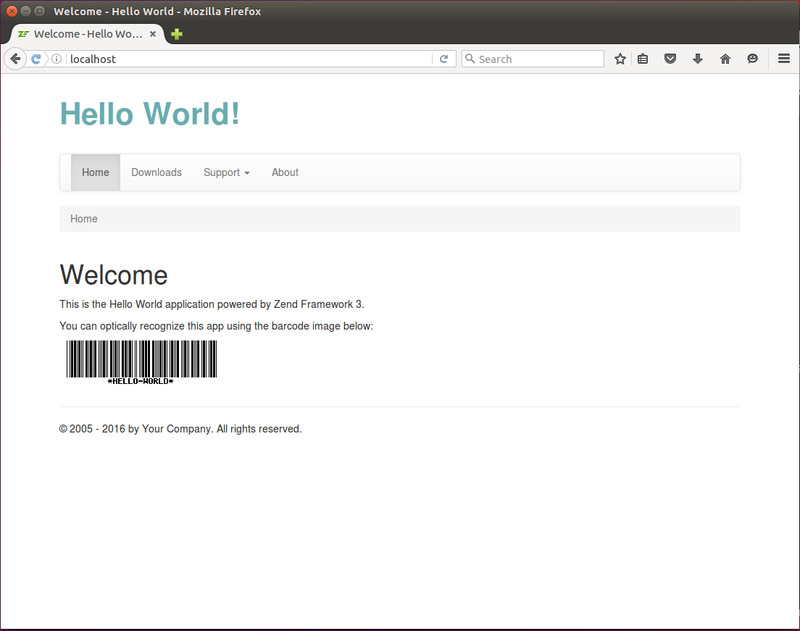 We want to make it display the "Hello world" page title, the "Hello world!" header text at the top, the navigation bar and breadcrumbs below the header, page content placeholder in the middle of the page, and the footer with the copyright information at the bottom (see figure 6.4 for an example of what we are trying to achieve). The page header containing the "Hello World!" text (lines 3-8). The header text spans four grid columns. For styling the text, we use our custom CSS class app-caption (we will define this class in style.css file a little bit later). We left the space for navigation bar interface component in line 11. In line 16, we have the space for breadcrumbs component. In line 22, we have the page content placeholder. When the renderer evaluates the page, it will echo the value of the $content variable, so the actual page content will be substituted here. And in lines 25-29, we provided the page footer with the text "(c) 2013 by Your Company. All rights reserved." You can change this text and substitute your company name here, if you wish. In the code above, we used the navbar interface component provided by the Bootstrap. We also used the Url view helper to insert the links to the navigation items. We discussed the usage of the Url view helper in the Generating URLs from Route section in Routing. Finally, we need to provide a couple of custom CSS rules to fine-tune the look and feel. We define our own CSS rules in the style.css stylesheet. In the CSS code above, we created the app-caption class which can be applied to <div> element and defining the 25 pixels vertical padding, large font size, bold text style and the hexadecimal representation of the RGB text color. Great, we've completed the page layout template! To see the result of our changes, open the site in your browser, you should see the page as in figure 6.4. You can click the links in navigation bar to visit the pages like About or Documentation, etc. The content of a particular page is put into the content placeholder of our layout. The result can be seen in action in the Hello World sample application that is part of this book's example code available on GitHub.